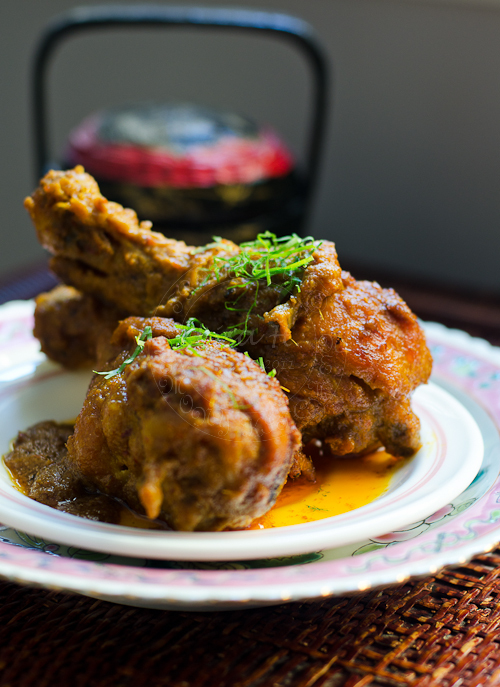 This Malaysian ~ Nyonya Kari Kapitan/ Nyonya Kapitan Chicken Curry post was scheduled to be "Published' last week, but BLOGGER decided to play up. I admit that I am not 'well versed' in computing... all those jargons scares me. Changes, updates, upgrades in softwares freaked me out as I feel that 'something' is lurking and waiting to pounce on me anytime. It took me awhile, to finally clicked on that 'Upgrade to Blogger New Interface'... but the story did not end there!. I soon found out that my current IE does not support the new Blogger format, hence I reluctantly made my migration to Google Chrome. That 'Something' did pounce on me... I returned the next day to review before clicking on the 'PUBLISH' button... to my horror... everything was GONE!!! what's left was just the title!!! I am clueless to what did happen... was it me or Blogger? My question to all my Blogger friends/experts out there... does this sounds familiar and has it happened to you too? I am in the dark... appreciate if someone could enlightened me on what is going on with BLOGGER new Format. 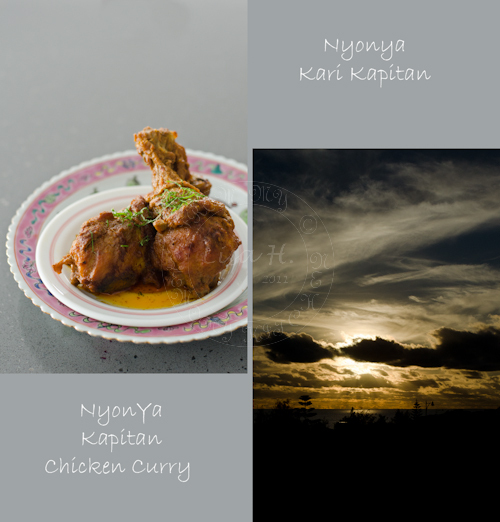 Kapitan is a Nyonya-Malay word for Captain... so Kari Kapitan... is loosely translated Captain's curry. Marinade chicken pieces with turmeric powder and salt for at least 2 hours (or overnight if time permits). Deep fry the chicken pieces until golden. Dish out onto the kitchen paper and put aside. Blend all the ingredients in the ‘spice’ list into a fine paste. Heat about 3 tablespoon of oil in a wok and sauté the spice until its fragrant and the oil ‘split’. Add in chicken and cook over medium heat for 5 minutes. Add coconut milk, kaffir lime leaves and brown sugar. Simmer for at least 10 minutes or until the chicken is tender. You are not the only one to get freaked out by Blogger changes and nerdy jargon... This curry looks fantastic! My kind of food. Ayam yang sedap, ngap!! Dear, do yourself a favor. NEVER use IE anymore to save yourself future heartaches. Chrome is the way to go. 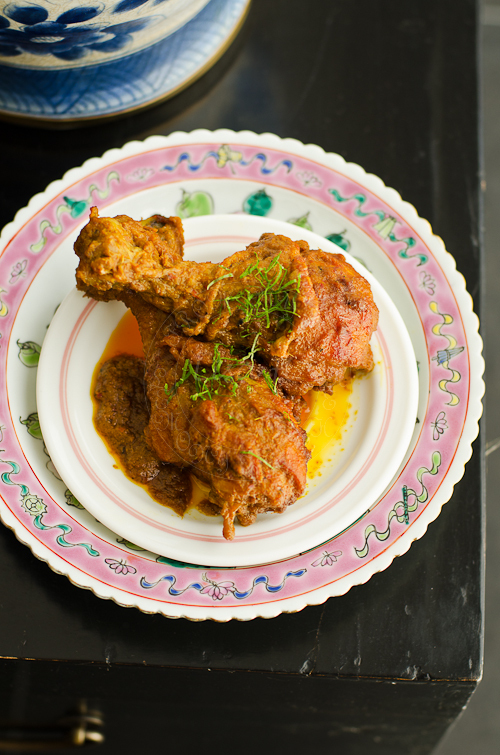 I love chicken cooked on the bone - it's so much juicier and more tender than the boneless, skinless kind. That definitely is finger licking good! The sauce would be so good on rice! This an amazing looking curry! And I bet it tastes even better than it looks :-). As soon as I get a second to cook, I am going to the kitchen to make it! Oh, sedapnya!! Can just go for two plate of rice! I must learn how to cook this, really!! Gorgeous :-) Thanks for sharing on RecipeNewZ! I want this chicken now.. I mean really I am drooling. Its not almost finger licking.. it is for sure. No idea with blogger, but like you anything new in computer freaks me out, even installing or downloading a little something.. I'm about to go to bed and I know your site is the most dangerous one! Your phtography is amazing... those drumsticks start to look like real!!!! I wish I can reach them! looking at your ayam really make me drooling..yea.something Blogger new interface acting up on me too..I keep switching from old to new if my pix can't upload.. This looks delicious!! I'll have to make it over the next week or 2! !